It’s officially soup season! Chicken tortellini soup season, that is. Unofficially, it’s been soup season for… all of my life. It’s always soup season for me. But now I feel as if I don’t have to hide my soup consumption. It’s getting chillier outside and people are starting to crave soup. Chicken tortellini soup is here to cure ALL. It’s funny – I never really care about tortellini own its own or with sauce, served as pasta. But as soon as it is in soup, I am ALLLLL over that. And it’s another recipe where you can utilize a rotisserie chicken! It’s not like you HAVE to use one. But this is a fantastic meal that comes together quickly during the week if you have leftover chicken or if you bought a rotisserie chicken during your weekend grocery shop. It’s a soup that tastes like you let it simmer all day long. But really, you made it in a frazzled mess after work. Errr. That’s probably just me. If you have a copy of Seriously Delish, then you’ll know that I have a recipe for creamy chicken noodle soup. It’s such a comforting and delicious meal. Warming – like a hug in a bowl. And pretty easy too. No fuss. I love regular old chicken noodle soup but a creamy version occasionally draws me in. And in this case, a creamy tortellini version. Instead of your egg noodle, we’re making things more fun. 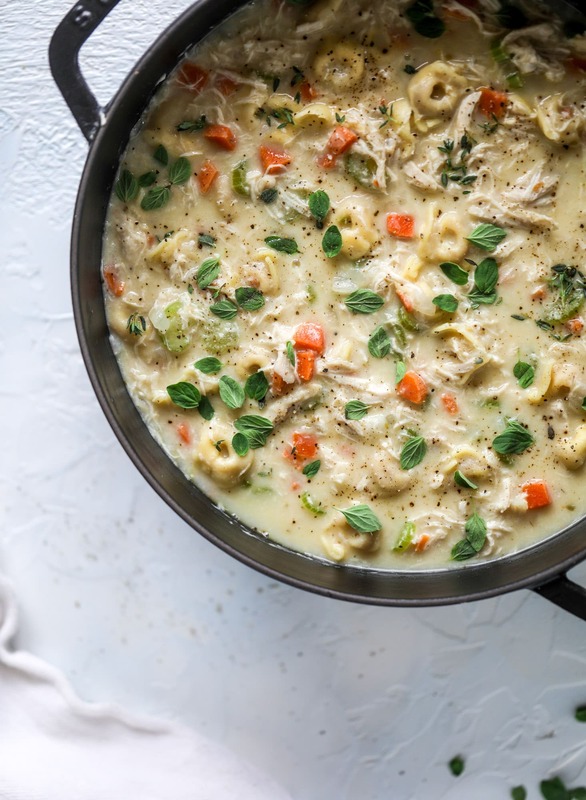 This chicken tortellini soup is HEARTY. It’s satisfying. A small bowl with a salad and a perfect piece of sourdough will make you the happiest person on earth. Heck, a small bowl at lunch alone will keep you happy and satisfied. Especially if you can find a variety of whole wheat tortellini! I used a pack of the DeLallo spinach and ricotta tortellini and it was SO fantastic. My favorite way to make a “creamy” soup is to add a slurry made with milk. It’s milk and flour, shaken together in a cup and whisked into the soup. I like this because it prevents the soup from being super heavy. It’s not a cream-based soup. It’s still a broth base soup, but then you whisk in the slurry and it thickens nicely and isn’t overwhelmingly creamy. I find that it’s perfect for weeknights when you crave a little comfort food. And then we can do crazy things like put it in a bread bowl or crunch crackers over top! This is the life. 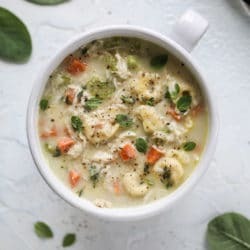 This creamy chicken tortellini soup is the perfect weeknight meal! It comes together quickly and is a great meal to use up a rotisserie chicken. It's satisfying and hearty, with tortellini replacing egg noodles for the pasta. Comfort food perfection! Heat a large pot over medium heat and add the olive oil and butter. Once the butter melts, add in the onion, carrots, celery, garlic, oregano, salt and pepper. Stir and cook until the veggies soften, about 5 to 6 minutes. Stir in the shredded chicken and cook for a minute or two. Add in the chicken stock and bring the mixture to a boil, then reduce it to a simmer. Add in the tortellini and cook it for 5 minutes. While the tortellini is cooking, fill a shaker cup with the milk. Add the flour to the milk and shake the cup for at least 30 seconds. After 5 minutes, stream in the milk slurry while stirring. Bring the soup back to a simmer and let it simmer for 10 or 15 minutes as it thickens. Taste it and season more with salt and pepper if you find it necessary. Sprinkle with fresh oregano and thyme and serve! Mug hugs. That’s what it’s like. Thanksgiving with MacKenzie-Childs! 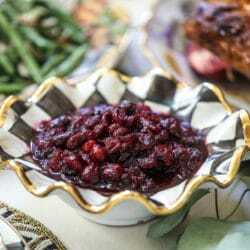 Chipotle Cranberry Chutney. The best type of comforting soup! It’s always soup season for me too! Even in our ridiculous FL summer heat. :) My fave way to use up rotisserie chicken! Love this. I’m very tempted to add lemon and dill! I impulse bought a bag of tortellini on the weekend so this is like fate! I can’t wait to make this soup. love that!! we’re on the same page. I’ve owned a shaker cup since living in Denmark for a brief period many years ago and this is the first time I’ve seen it mentioned in a recipe! This soup sounds divine and so family friendly! I have the Pretty Dish and have loved all of the recipes I have tried to date. I save recipes that I like on line to Pinterest as I don’t have access to a printer. Is there any way you can add Pinterest to your blogged or instagram recipes so I can save them. There have been so many that I would love to try. Keep the great posts coming! hi cheryl!! thanks so much!! if you run your mouse over the photo, are you able to pin it? This sounds delicious! Do you think Almond milk be ok? Thanks! And, I’m with you about tortellini — I don’t particularly gravitate toward them as a pasta dish, but whenever I see “tortellini en brodo” on an Italian restaurant menu, I’m like, oooooh!! LOL, I think it’s because it reminds me of an Italian version of wonton soup (which is my favorite comfort soup). thank you so much CJ! Won’t that slurry make the soup taste weird/floury? Looks gorgeous and delicious! Did you use dry tortellini or fresh ones? Because 5+ minutes sound like a lot, i’m affraid they might break? So easy – comfort food at it’s best on a cold night! this looks so dreamy. perfect as part of a first-week-in-our-new-house meal prep! thank you for sharing! This looks delicious! Would this soup freeze well? I use fat-free evaporated milk instead of cream in soups & sauces. Gives you the rich taste without the fat. I want to make for my grandma! Jessica, Can you give me a tip for making it more healthy? This soup is fantastic and fairly healthy as it is. Some ways you could make it a little healthier are add more veggies, double olive oil (instead of butter), use low/or no sodium stock, whole wheat tortellini, and 1% milk for the slurry. Just made this tonight! Easy to make & perfect for the fall weather! Definitely putting this in my recipe rotation. I make almost the same soup, but I make little turkey meatballs! I discovered a couple years ago that I can throw just about anything into a soup if I do the milk slurry and my husband will LOVE IT! Oh my goodness! This is the most delish soup!!! We used half & half instead of milk and frozen tortellini. Ana, the frozen tortellini worked well. You just have to watch it. The bag I used was 19oz so I doubled the recipe. It doubled very well in my dutch oven. The only thing I will say is that the veggies took longer than 5-6 minutes. Maybe frozen veggies wouldn’t take as long (or maybe I didn’t have the heat high enough). My family loved this recipe including my picky teenage son. This recipe is a keeper! I like the base so much I will be using it for my creamy potato soup I make every winter. Thanks so much! I made this soup today and my husband has declared that this is now his favorite recipe! I’m wondering if you have nutritional information? Thanks! Looks delicioso! Quick question … dry, frozen or fresh tortellini? The dry and fresh cook up so quickly that 5+ minutes might make it to soft & mushy…. can’t wait to make this! Okay, I have to ask….what is a shaker cup? Obviously, I don’t have one so what can I use instead? Do i just whisk the milk and flour together? This soup looks right up my alley! Such a great recipe! My picky eaters loved the tortellini. Such a game changer from trying to get them to eat regular chicken noodle soup. Thank you! made this with my leftover turkey! Amazing!! My entire family went nuts for this soup! We loved it! I made this last night for me and my husband. This is definitely our new favorite soup! I used rotisserie chicken and added fresh rosemary. Thank you sharing this wonderful recipe. Did you ever say if you used dry or fresh Tortillini? Delish! I cooked the chicken for this in my slow cooker in chicken stock, some hard cider, garlic and other spices. Then I saved the cooking liquid and used it as some of my broth (strained it first). Worked great! I’m a pretty bad cook and even I was able to make this. My whole family loved it. It’s become a staple around here. I use cheese tortellini (most seem to be) and it is so delicious!! !